The 4th Istanbul Design Biennial, organised by the Istanbul Foundation for Culture and Arts (İKSV) and sponsored by VitrA, came to a close on Sunday, 4 November 2018. Titled A School of Schools and curated by Jan Boelen with associate curators Nadine Botha and Vera Sacchetti, the 4th Istanbul Design Biennial presented an ambitious programme of exhibitions, projects and events which spanned the city of Istanbul. At the heart of the biennial was an ambition to create a safe space for learning in which established norms and conventions could be questioned. More than 200 interdisciplinary practitioners from across the globe presented projects which investigated the evolution of design education; the convergence of traditional craft practices with technology; the production of networks; and alternative hierarchies of knowledge. The exhibitions, which more than 200.000 visitors had the chance to experience, spanned a diverse range of subjects from maps to food; measurement units; time; craft; artificial intelligence; painting and space stations. Taking over six of the city’s most iconic cultural institutions in the Beyoğlu district with a range of free-of-charge exhibitions and events, each venue became a school itself, investigating design from a different perspective: Unmaking School at Akbank Sanat, Currents School at Yapı Kredi Culture Centre, Scales School at Pera Museum, Earth School at Arter, Time School at SALT Galata, and Digestion School at Studio-X Istanbul. The biennial’s theme sponsors include Yapı Kredi for Currents School, Yeditepe University for Scales School, İstanbul Kültür University for Earth School, Panerai for Time School, and Metro Cash&Carry Turkey for Digestion School. This year, the 4th Istanbul Design Biennial became a platform of production, sharing and learning over a period of six weeks, with close to 150 events. The rich and inclusive public programme included a wide range of activities, from interviews to performances, facial yoga exercises, blockchain workshops, collector talks, food workshops, café conversations, and mapping studies. With an expanded biennial footprint, which saw projects extend beyond the main venues to satellite sites, A School of Schools transformed Istanbul into a site of learning and discovery. A post-earthquake dwelling was mounted on the Golden Horn waterway as part of the Earth School satellite at Koç Museum. The floating structure, designed by SO?, an Istanbul-based architecture and urbanism studio, and collaborators, is a prototype of a home that could safely house 4 – 6 humans in case of a serious earthquake or natural disaster. A photographic exhibition capturing architecture schools in Istanbul and Ankara by Naho Kubota was held in Taksim Square for two weeks. Two giant eyes positioned atop the Scales School satellite The Marmara Pera Hotel tracked the movements of the International Space Station (ISS). 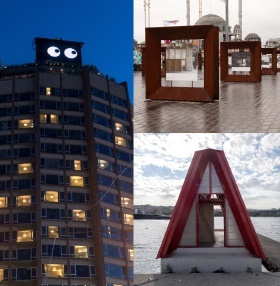 Titled EYESS ISStanbul, the playful installation which invited citizens to look up and question who is looking at who, was designed by AATB. The reach of the biennial was further expanded through the development of walking tours which led participants on a journey through the streets of Istanbul. With support from Mavi, the international apparel and accessories brand from Turkey, eight Design Routes offered participants the opportunity to immerse themselves in Istanbul’s design culture, discovering hidden haunts in the company of leading creatives. Renowned author Ahmet Ümit led the 3 Novels 1 Walk tour through the streets of Beyoğlu; food blogger Sinan Hamamsarılar (@tatdedektifi) explored the delicious street food on offer in Beyoğlu; the “Pedallıyorum” team led a cycle tour along the banks of the Bosphorus; Professor Murat Güvenç led participants on an exploration of Istanbul’s historical peninsula area; Efruz Çakırkaya, Istanbul Music Festival Director, and Harun İzer, Istanbul Jazz Festival Director, took music enthusiasts on a musical walk around Beyoğlu; designer, curator, historian and theorist Gökhan Karakuş visited the ateliers and studios of artisans, designers and artists on the Makers of Today’s Istanbul tour; and co-founder of Teğet Architecture, Ertuğ Uçar, told the stories of lighthouses across the Bosphorus on Istanbul’s Lighthouses tour. In the spirit of learning and education, the biennial organised a special series of events that united various universities from Turkey and abroad. Through a series of events, titled A School of Schools: Academy Days, more than 20 universities were involved in around 40 projects based on the biennial theme with event participants at the biennial venues. Istanbul Kültür University, theme sponsor of the Earth School, Yeditepe University, theme sponsor of the Scales School, and Istanbul Bilgi University, one of the biennial’s contributing institutions, presented a programme of panels, exhibitions, workshops and talks throughout the biennial at the biennial venues and university campuses. A children’s book by the biennial: So Long, So Big, So Many! The design biennial also saw the publication of a children’s book called So Long, So Big, So Many! with the support of the Bernard Van Leer Foundation. Written by Yekta Kopan and co-designed by Yekta Kopan and Burcu Ural Kopan with illustrations by Ada Tuncer, the book introduced children to design and measurement through spaghetti making with games and stories. Published in Turkish, English and Arabic; the book was distributed free of charge in selected bookstores as well as in the biennial venues. Within the scope of the film programme, prepared by Pera Film, 50 documentaries and fiction films examining the concepts of education and learning were screened at Pera Museum. The 4th Istanbul Design Biennial, in collaboration with the Pera Learning team, created a special learning programme with contribution by Design Academy Eindhoven graduate Mark Henning. In the Scales School, the dedicated learning programme, designed for various age groups, invited students to question, debate and design new work around the fluidity of measures and norms. The programme was offered free of charge and supported by the Genç Kültür (Culture Kids) programme of the Netherlands. Biennial visitors who wanted to learn more about the projects had the chance to visit the exhibitions with young guides. In addition to venue-specific guided tours, the biennial offered guided walks between venues located on two different routes in Beyoğlu and Karaköy. A number of Night Routes were also offered after nightfall. The biennial exhibitions were also visited with the new mobile app “Sesli Rehber,” which featured an audio-guide in English with the voices of Selma Ergeç, Okan Yalabık, Sema Mağara, Nadine Botha, Filiz Ova and Deniz Ova. Click to watch the exclusive conversations between the 4th Istanbul Design Biennial curator Jan Boelen and design writer and curator Emily King about the biennial projects on the biennial’s Instagram TV. What did we learn from the biennial? The 4th Istanbul Design Biennial is organised by İKSV under the sponsorship of VitrA. The biennial’s theme sponsors include Metro Cash&Carry Turkey for Digestion School, İstanbul Kültür University for Earth School, Yapı Kredi for Currents School, Panerai for Time School, and Yeditepe University for Scales School. The biennial workshops are sponsored by Edding. The biennial’s panel and conversations are sponsored by VitrA. Mavi is the sponsor of the biennial’s ‘Design Routes’. Omnia Su Collection by Paşabahçe Stores is the special project sponsor of the biennial. Other contributing corporations and institutions of the biennial are: Türk Tuborg A.Ş., Arçelik, 3Dörtgen, Borusan Holding, Ersa, Fibrobeton Yapı Elemanları San. İnş. Tic. A.Ş., İstanbul Bilgi University, Kartek Technologies, KUKA AG, MEF University, Metal Yapı İnşaat Taahhüt San. Dış Tic. A.Ş., QNB Finansbank, Q-artz, Sotheby’s, Tempo, The Stay Hotels, Türk Ekonomi Bankası (TEB), and YazıcıLegal. The biennial is realised in collaboration with the Creative Industries Fund NL, Z33 – House for Contemporary Art, Graham Foundation for Advanced Studies in the Fine Arts, Swiss Arts Council Pro Helvetia, British Council, DutchCulture | Genc Kultur, Acción Cultural Española (AC/E), Goethe Institut, Spaces of Culture, Flemish Ministry of Culture, Austrian Cultural Forum Istanbul, University of Southampton and Camões – Institute for Cooperation and Language of Portugal / Embassy of Portugal in Turkey, Iaspis, Consulate General of Sweden and Swedish Institute. The Leading Sponsor of the Istanbul Foundation for Culture and Arts is Eczacıbaşı Group, Official Carrier is DHL, Official Hotel Sponsor The Marmara Collection, Insurance Sponsor is Zurich Turkey, Health Sponsor is Acıbadem Health Group, and Service Sponsors are Navitas, GFK and AGC. The 4th Istanbul Design Biennial also receives support from the Ministry of Culture and Tourism, Governership of Istanbul, Istanbul Provincial Directorate of Culture and Tourism, Istanbul Metropolitan Municipality, Beyoğlu District Governership, Beşiktaş Municipality and Beyoğlu Municipality.